Published in Folia Geobot. Phytotax. 18: 445. 1983. Synonymy. 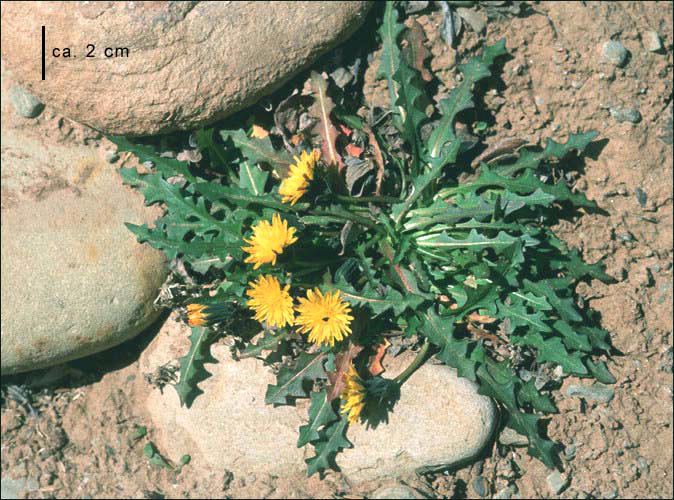 Taraxacum pumilum Dahlst. (1905), non Gaudich. (1825). Vegetative morphology. Plants 5–12(–20) cm high; perennial herbs; with milky juice. Taproot present. Caudex present. Aerial stems a small transition zone between taproot and basal leaves. Leaves mainly basal, or basal in a rosette; patent (usually); alternate; dying annually and non-persistent. Petioles present, or absent; 0–30 mm long; winged; glabrous. Leaf blades simple. Leaf blade bases attenuate. 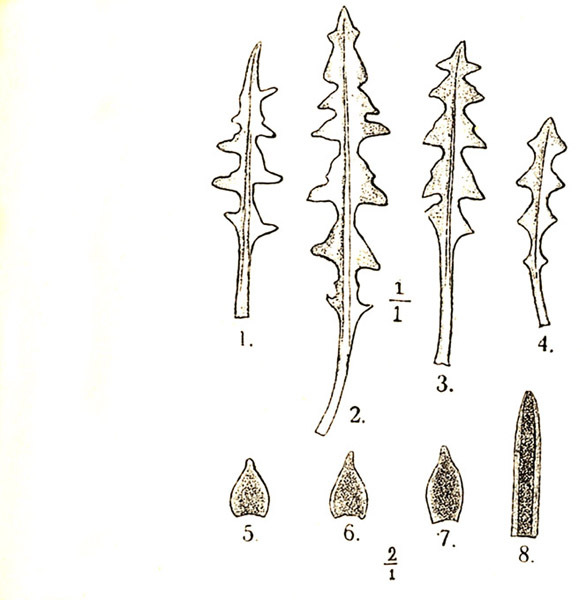 Blades (15–)20–60(–90) mm long, 3.5–13 mm wide, lanceolate, flat, appearing single-veined. Blade adaxial surface glabrous (dark green). Blade abaxial surface glabrous. Blades lobed. Blade margins runcinate and dentate (on larger leaves), glabrous, with teeth all around the blade; degree of incision 50–80%; apices acute. Reproductive morphology. Flowering stems without leaves. Flowers in inflorescences. Inflorescences solitary heads. Flowering heads (10–)15–20 mm deep; 17–25 mm wide (described as about 2 cm in diameter when fully open Porsild (1957); this species usually presses with the flowering head side on); with only ligulate florets. Inflorescences not elongating as the fruit matures. Pedicels absent. Involucral bracts present. Number of rows 3–4. Outer involucral bracts mostly green (olive green with some reddish tinges); spreading to erect; ovate, or lanceolate; 3–6(–7.5) mm high; 1.8–2.5(–3) mm wide (narrower than T. hyparcticum); glabrous. Inner involucral bracts linear; 8–15 mm high; 1–3 mm wide; margins narrow and scarious, less than one quarter of the bract; apex with or without horns or calluses (commonly merely callose-tipped but often also with horns on at least some of the bracts). Flowers per inflorescence 30–50(–60); bilaterally symmetrical (zygomorphic). Sepals represented by a pappus. Pappus with a single row of hairs; yellowish (tawny CAN 311645), or whitish. Ligulate florets pappus 7–10 mm long. Petals conventional; fused; 5; yellow (a deep yellow; see image library; outer ligulate petals drying with a central greenish grey or sometimes pinkish stripe, and dark on the curled petal tips); with contrasting markings (with a distinct stripe, sometimes when pressed), or without contrasting markings (live plants). Corolla flat, strap-like. Ray florets limb 1–3 mm wide. Ligulate florets limb 30–50(–60) mm long; 12–18 mm wide. Stamens present (pollen present); 5. Anthers yellow; 3.8–4.2 mm long. Ovary inferior; carpels 2; syncarpous. Styles 1. Stigmas per ovary 2. Placentation basal. Ovules per ovary 1. Fruit sessile; with calyx persisting; dry; cypselas; obovate; yellowish, or straw-coloured; 3.5–4.2 mm long; 1–1.2 mm wide; surface appearing veinless; indehiscent. Cypselas beak slender, often much longer than the body; surface spinulose; surface throughout. Seeds 1. 2n = 16. Holmen (1952, Greenland); Mosquin and Hayley (1966, northern Canada). Ecology and habitat. 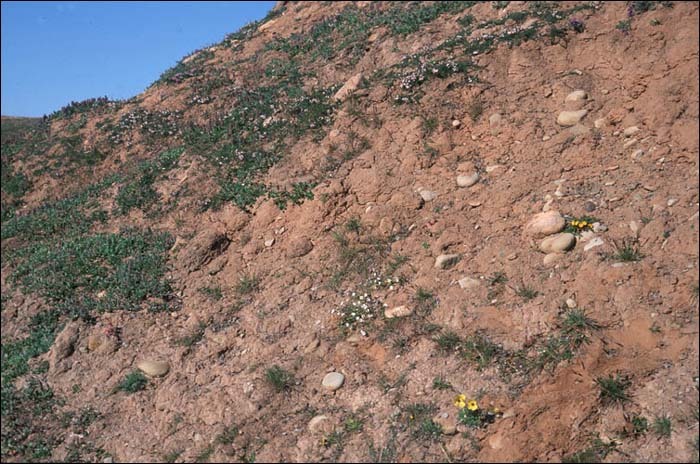 Substrates: depressions of low-centre polygons, hummocks; rocks, gravel, clay. North American distribution. Northwest Territories Islands, Nunavut Islands. Range in the Canadian Arctic Archipelago limited. Common. High Arctic. Arctic islands: Baffin (and Resolution Island), Ellesmere, Axel Heiberg, Parry islands (Prince Patrick), Banks, Victoria, Prince of Wales, Somerset, King William (and Melville Peninsula). Northern hemisphere distribution. North American. Central Canada, Ellesmere Land  Peary Land, East Greenland. General notes. This High Arctic dwarf species has plants with leaves that are usually patent, and deeply runcinate with staggered lobes on either side of the midvein. The degree of incision of the sinuses reaches almost to the midvein, and there are often additional dentations on the runcinate lobes. Petioles are almost without a wing at the base. The inner phyllaries (involucral bracts) are constricted, calloused, and often horned; the outer petals have a distinct stripe that is more obvious in pressed material. The cypselas are straw-coloured with beaks that have a distinct cone. The cypselas are spinulose throughout, but more strongly so towards the apex. Illustrations. • Habitat. 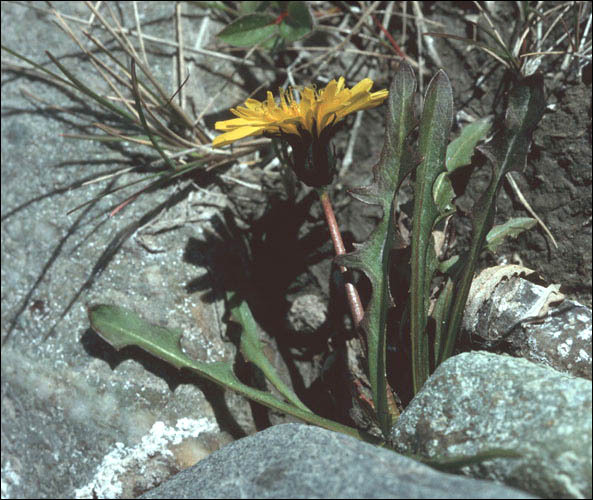 Mid-picture on right-hand side growing beside rocks, an isolated plant with chrome yellow flowers. Note the contrast in yellow with the poppy towards the base of the picture. N.W.T., Melville Island, McCormick Inlet. L. Gillespie 6928 and L. Consaul. CAN. • Surface view of plant. Plant with patent leaves that are deeply runcinate with triangular-shaped lobes. N.W.T., Melville Island, McCormick Inlet. L. Gillespie 6928 and L. Consaul. • Close-up of plant. 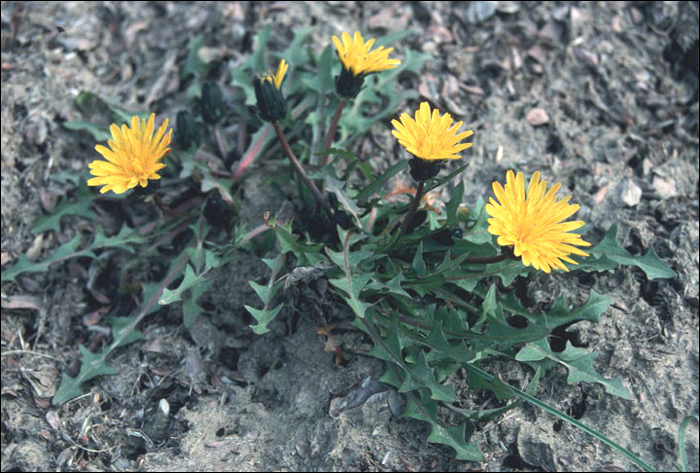 Plant with chrome yellow flowers, and deeply runcinate leaves with lobes that are sometimes almost opposite and sometimes also dentate. Nunavut, Ellesmere Island, Slidre Fiord. Photograph by Lynn Gillespie. No voucher. • Side view of flower. Plant with deeply runcinate leaves that are sometimes dentate. Involucral bracts may have horns or calluses. Nunavut, Ellesmere Island, Lake Hazen. Lynn Gillespie 6224 and C. Vogel. CAN. • Close-up of flowers. 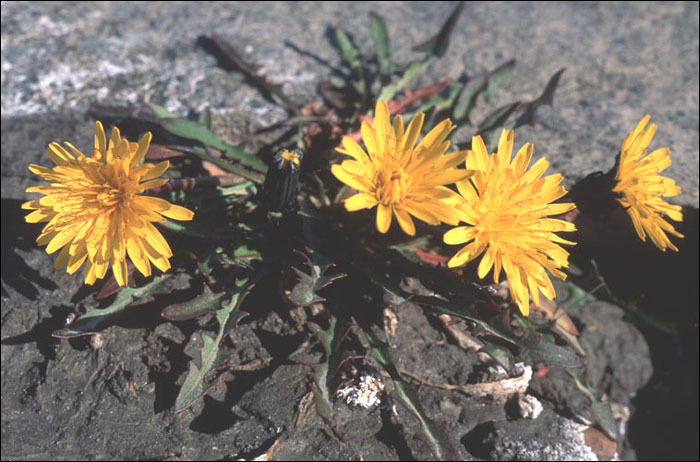 Flowers with chrome yellow petals and yellow stigmas that dry dark brown or black. Nunavut, Ellesmere Island, Lake Hazen. Lynn Gillespie 6224 and C. Vogel. CAN. • Black and white plate. Illustration from the type description by Dahlstedt (1905). Note the runcinate leaves and ovate outer bracts and the linear inner involucral bracts. Fruit was not illustrated by Dahlstedt. • Arctic Island Distribution.